It’s not even 8:30, and I’m headed to bed. I’ve been a bit of a party animal this week; Amanda was here a couple of days, a lot of old friends have been coming through town, and we’re hosting a couple from Boston for a few days. So a bit more wine has been consumed that usual, and a few more bedtimes have been ignored. Time to get back to my “this is what healthy people do” routine. I FINALLY made it to the gym tonight after almost of week of schedule chaos then hurting my back. I was craving some basic boring cardio for some reason, so I spun it out on the elliptical for a half hour and caught up on blogs. Then I did my normal squat-deadlift-lunges combination, mixing it up a wee bit by trading off sets of squats and deadlift. I’m up to the 40 lb dumbbells for both exercises, so by switching between them I feel like I take up less time and get some interval work in. Then I did lunges up and down the hall with 12.5 lb dumbbells. I made another experiment for dinner. Lazy stovetop chili. 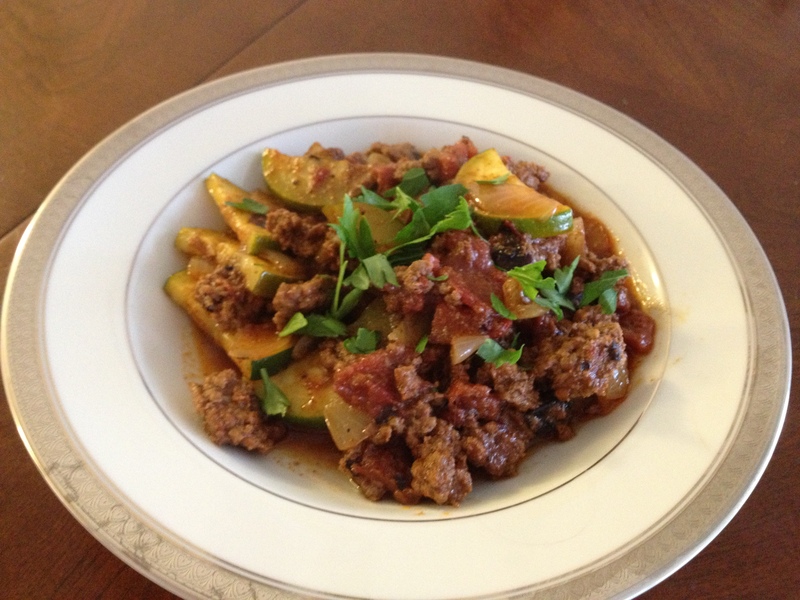 I did my usual sautee onion and ground beef with Mexican spices, then I threw in a can of roasted tomatoes and some zucchini (because we had a zucchini that needed to be eaten). I’m sure if I left it to simmer for a couple of hours the flavors would meld better, but I was hungry. At least I paused long enough to garnish it with parsley and take a picture. Really titillating stuff, I know. Time to get some sleep so my brain shall function better tomorrow. The One With a Free Lunch! Love meals like that, and by the next day the flavors taste even better.